Rewards cardholders, we hope you are ready for something new and different! 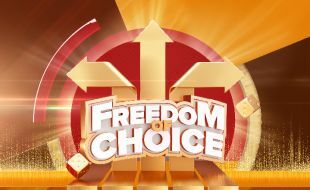 Our new promotion – Freedom of Choice – is the first EVER of its kind at Emnotweni! And there’s over R900,000 in cash and prizes to be won! OR you can choose both! Now that’s Freedom of Choice, wouldn’t you say? How many points do I need to earn to qualify for all other draws? Does the colour/status of my Rewards card make a difference? Not this time – you can choose which draws to enter, no matter whether you’re a Gold, Platinum or Black Rewards cardholder – it’s your FREEDOM OF CHOICE! How much time do I have to earn my points for the draws? What if I want to choose FreePlay instead of draw entries? What if I only want to choose draw entries? What if I want to choose both FreePlay and draw entries? So, the more points you earn, the more Freedom of Choice – you can configure your options as you choose! What are the cut-off times to select my FreePlay or draw entries? How and when will I know what I qualify for? This promotion is open to all Rewards members. The promotional period commences at 08h00 on 15 February and ends on 30 March 2019. Draw entries cannot be purchased for cash, points burning or through any other form of consideration. Tickets or FreePlay will be issued for points earned by playing Slots and/ Tables during the promotional period. Only points earned up until 07h59 on the day before the draw will be considered for the draw on the following day. Ticket earning is limited to a maximum of 60 per draw day. No participant will have more than 60 tickets on the day of the draw. Participants have a choice to redeem draw tickets, FreePlay or both based on points earned. Participants qualify for R50 FreePlay for every 1,000 points earned - up to a maximum of R250 during the earning period. Participants may choose to enter the draw/s, by making their selection and submitting entries at the eHost anytime from 08h00 in the morning until 5 minutes before each of the draws. FreePlay is redeemable at the eHost anytime from 08h00 in the morning until 21h00 on the day of the draw only. Participants may have more than one ticket in the entry bin per draw but can only win once per draw. Prize winners will be selected by way of random electronic draw. Participants must activate their entry into the draw(s) at the e-Hosts, on the day of the draw(s) prior to the actual draw(s) within the specified times during which the entry bins are open. The opening and closing times for the entry bins are specified above. Participants may register to decline to be present at the draws by completing a Proxy Form. Participants may nominate a Proxy to act on their behalf if they choose not to be present. Positive and acceptable form of identification must be presented by Participants and Nominee (If applicable) when completing a Proxy Form. The prescribed Proxy Forms will be available at the Customer Services Desk from 08h00 to 15 minutes before each draw on the day of the draw where a participant can register to still be acknowledged for the prize, should he/she decline to be present for that draw or when the prize winners are announced on that day. Prize winners who are present will be given 90 seconds to present themselves and must be in possession of evidence of the winning ticket and/or Rewards card belonging to the prize winner and/or positive and acceptable form of identification. Reasonable steps shall be taken to verify a prize winner using the Patron Management System, should the prize winner not be in possession of valid identification. Should proof of identification not be available on the system or the system is offline, verification will not be possible and the onus is on the prize winner to present a valid form of identification. Should the prize winner not present themselves within 90 seconds, and there is no record of the prize winner declining the invitation to be present by completing the Prescribed Proxy Form, a re-draw will take place. Should a prize winner who is eligible for a prize but who is not present as a result of declining an invite to be present for the draw by completing the Prescribed Proxy Form, the casino shall take all reasonable steps to contact the prize winner via the contact details provided in the Prescribed Proxy Form. In such circumstances the prize winner may claim the prize within 15 days from the day of the draw at the Guest Services Desk. An extra R50,000 in CASH will be given away at the 21h00 on 30 March - Final Draw to the first prize winner. The prize winner must claim the prize at Emnotweni Casino within 15 days of the draw. Prizes are not transferrable and cannot be exchanged. Prize winners must sign for receipt of prizes. In the event of technical failure or damage to the device used for the promotional draw, irrespective of the cause, another suitable device or method will be used, at the sole discretion of Management. This may include rescheduling times and a draw date.